Freshly popped popcorn from the stove-top or an air popper, maybe with a touch of butter & a little salt – is there anything better? Well, yeah, there is! Popcorn tossed with goodies and drizzled with white chocolate. Now you’re talking! 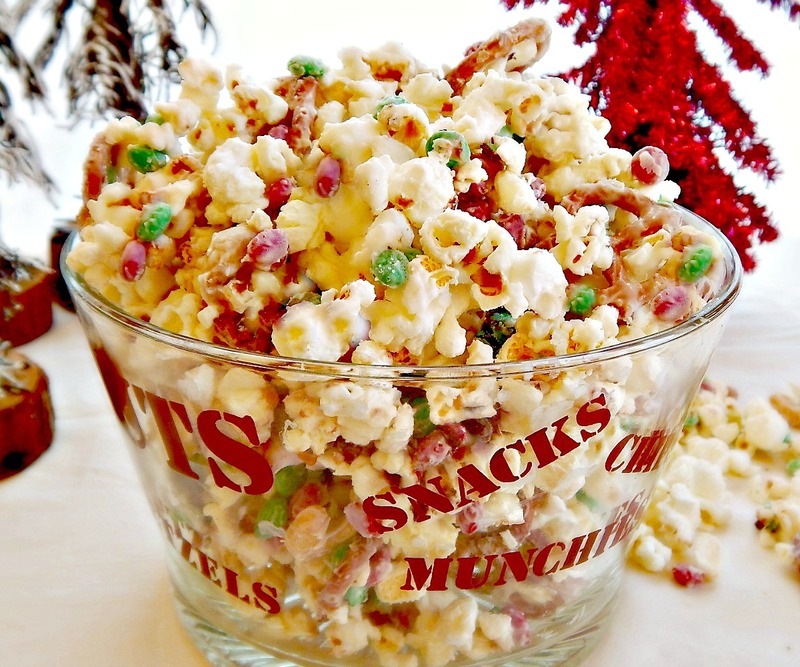 White Chocolate Christmas Popcorn Party Mix – Mini m&ms, white chocolate, pretzels & mini marshmallows; this batch didn’t have the Holiday m&m’s. Talk about a salty, sweet crave-worthy addictive treat. Simple to make – and takes minutes. You’re going to hate me because you’ll find out how EASY this is and you won’t want to stop eating this stuff! And you can totally change up this recipe to add in whatever you like, making it even MORE crave-worthy. I pop my own popcorn and try to avoid the microwave stuff, which I’ve never “warmed up” to. 1/2 cup of kernels yields 16 cups popped. If you use microwave popcorn, try a “plain” one that has as little “stuff” as possible. You’ll need to figure out how many cups each bag has in it – multiply out the servings per bag by the serving size because they vary by brand – you’ll want 2 to 3 bags. Once you have your popcorn, then you’ll add in whatever you like – I used pretzels, Christmas mini M&M’s and mini marshmallows. It was like magic, and surprise, the marshmallows were the best part! Use the best white chocolate for the best results – it really makes a big difference. You might have to add a tablespoon or two of oil to the white chocolate and whisk it up if it’s too thick to pour after it’s melted. Pop popcorn using the desired method. For stove-top, add three kernels of popcorn to a large pan. Add enough oil (a tablespoon or two) to come almost halfway up the sides of the kernels. Turn heat to medium-high. When the three kernels pop, add the rest of the popcorn, cover and shake continuously as the popcorn pops. When there is a second (one-one thousand) between pops, remove from heat and immediately pour into a very large bowl or pan, or divide into two large ones. Add in the pretzels, M&M’s and mini-marshmallows and toss. Melt chocolate in the microwave. Start with a one minute increment, then stir and place back in the microwave for 30 seconds. Remove and stir. If not melted, heat for another 30 seconds & stir. Repeat until melted. Drizzle the chocolate over the popcorn mixture and mix well with a large spoon, spatula or clean hands. Spread out onto two large sheet pans lined with waxed paper, parchment or foil. Sprinkle with salt. Allow to sit until the chocolate has hardened, break apart and eat. If your white chocolate, after melting, is still too thick to drizzle, whisk in a tablespoon or two of oil. Using oil should prevent the chocolate from seizing. If your mixture isn’t sticking together, add more white chocolate or place in a warm oven for several minutes then turn over gently several times with a spatula. This may cause the marshmallows & m&m’s to become melty and crack a bit which is delicious, also. White Chocolate Christmas Popcorn Party Mix this one has the red & green m&m’s but I don’t know what went wrong with those pics! I’ll be bringing this recipe to our very own Throwback Thursday as well as to Fiesta Friday. Our Fiesta Friday co-hosts this week are Caroline @ Caroline’s Cooking and Tânia @ Iwanttobeacook. This entry was posted in Click here for Fabulous Food Posts and tagged Appetizer, Candy, Desserts, M&M's, marshmallows, Popcorn, pretzels, white chocolate. Bookmark the permalink. Oh, just make it anyway! This is really goooood!! Thanks for the reblog, and Merry Christmas!! Mollie! Someone gave me a bag of white chocolate popcorn and it was insanely delicious. Addictive actually. I’m inspired now to make my own. Happy holidays and all the best for 2017! I really like the combination of sweet and salty in this fun, easy snack recipe! Happy Holidays. Mollie this looks delicious, I love popcorn especially flavored, what a great idea and I think I think I could eat way too much of this. Happy Holidays!! BTW, did you send me an email about a dog that needs help? Didn’t recognize the email address but the name was Mollie. Let me know and thank you. If you did I have concerns. HI, and yes, I did – I was going to stop by your blog & give you a heads up that I sent the email to you, then got distracted by stollen and dozed off! It was pretty late. That was my personal email. Ah I didn’t know I will respond to your email now. This snack looks delicious! and….so addicting! You would not believe how many batches I’ve made!! We all ate a lot and then some for gifts…I am on a three day sugar bender from this stuff!! Rhonda, it’s so good it’s dangerous, lol!! What a fun mix! Have a merry Christmas! 🙂 That’s what I thought, too! This looks so good, I’m going to try it 😉 Thanks for sharing at Fiesta Friday! I’m sure you’ll love it! Honestly we had a hard time not eating it all! !